The Refined Geek » I’m Done Waiting, Google. Incidently I got my parents a Nexus 10 before XMAS. It was a similar story. I was checking the Google website daily seeing if it wasn’t sold out in Australia. I then took the plunge and ordered it (from this the same online supplier) so they would get it before XMAS. Arrived on time. Perfect for my parents. I think the tablet is brilliant too… very tempted to get myself one. 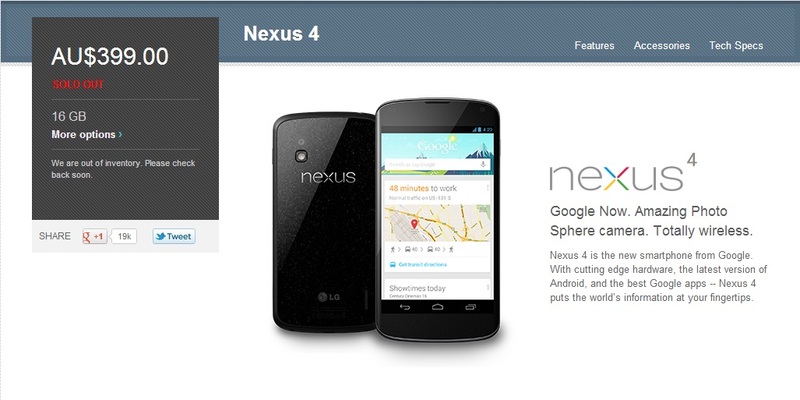 Anyway Google dropped the ball on both the Nexus 4 and 10. I had a look around, not a good one though, for a Nexus 4 from another source and couldn’t turn up one at a price I was happy with. I could’ve stomached $50 more a month or two ago but I think I’ve soured on the whole idea >_< Sounds like it'd be a solid upgrade for her though 😀 When I saw the price on the Nexus 4 and 10 I was really, really tempted just to get both as the combination was pretty close to what I've paid for phones outright in the past. The supply issues are a real shame as otherwise I, and I'm sure many others, would've taken Google up on their amazing offer. Ah well, maybe next time. Nexus 4 is very good! My GF is very happy with the choice. Looking forward to my Samsung GSIII 4G getting the newer Andriod now. My previous phone was the original WP7 Samsung Omnia 7 and whilst that did everything I really needed going to Andriod (forced due to screen break and luckily I was out of contract) showed me what I was missing. I thought about the WP8 but(they weren’t released yet at the time. Glad I got the Andriod. Anyway if Google didn’t have supply issues on the Nexus 4 & 10 I think they could have won over more of the Apple dominance… the value for money is senstational. Yeah you sound like you’re in a similar position to me although I was an Android user previously. I’ve got a couple friends with the new WP8 Nokia Lumia 920 and they seem to really like it but I think I’m an Android man at heart so I’ll be going back to them as soon as I can. Totally agree with you on that, such a shame.